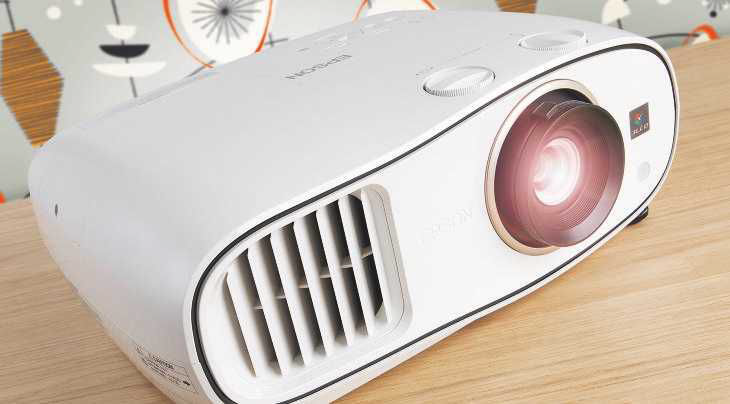 THE EH-TW6700 IS the newest iteration in what has proved a long-running and popular line of home cinema projectors from top LCD purveyor Epson. It combines a manageable form factor with bullet-proof setup and high-quality 1080p imagery. But given the growing hubbub surrounding 4K, does it still make sense to invest in Full HD theatre? While the EH-TW6700 may be just about compact enough for impromptu coffee table use, it’s really intended for permanent installation in a home cinema room. This long-throw projector can cast a 100 in screen from anywhere between 2.95m and 4.8m. Some will recognise this as a refresh of the previous EH-TW6600, albeit with higher brightness (up 500 Lumens) and slightly better contrast. Epson quotes an impressive (Colour) light output of 3,000 Lumens and a dynamic contrast ratio of 70,000:1. The projector has two siblings in the Epson stable: the EH-TW6700W, which adds a wireless HDMI transmitter, and the step-up EH-TW6800, which improves contrast again to 120,000:1, and has a 12V trigger, which is missing from this model (a point to bear in mind if you want to run an electric screen). The PJ’s lens is offset to the right, with hot air vented front left. Two rotary dials, for lens shifting on the horizontal and vertical, are positioned above. Zoom (1.6x) and focusing are done manually. When it comes to lamp life, Epson says you can expect 5,000 hours in Eco mode, which roughly translates to around a movie a night for seven years before you need to contemplate a lamp change. But don’t necessarily expect it to last that long. The 4K uprezzing and HDR playback of more expensive Epson models are off the menu here. But that doesn’t stop picture quality looking consistently cinematic. The unnecessary Point Break remake (Blu-ray) offers dramatic vistas which the Epson revels in; the opening mountain top trail-bike ride is full of travel-show impact. Sun flares dazzle courtesy of its potent brightness, and there’s pleasing filmic grain. During the vision sequence in Batman vs Superman: Dawn of Justice (Blu-ray) the sandy, gritty texture of the picture is fittingly apocalyptic. It’s a dramatic contrast to the near-dark, rain-sodden slugfest between the protagonists which follows. Both sequences look great on this projector. In fact, this has eye-candy appeal straight from the box, with an Auto mode that removes control over image parameters, but offers onscreen results that are well judged with no excessive edge enhancement. It will serve most sources well. If you want to tweak, other presets give access to the usual adjustments. Bright Cinema is generally effective when you need additional luminosity, although I still wouldn’t advocate the EH-TW6700’s use in high ambient lighting conditions, as colour vibrancy and contrast fall away quickly. This PJ doesn’t deliver the genuinely deep black that many will crave, but its inherent brightness keeps things pleasingly dynamic. Colour fidelity is excellent, with rich hues (particularly blues and oranges) really adding zing. And, unlike single-chip DLP projectors, there’s no rainbow effect to distract. Contrast is acceptable in a light-controlled viewing environment. The model’s Auto Iris feature can be left off, but Epson has made major strides when it comes to executing effective auto iris control, and you’ll need to listen carefully if you want to hear the iris blades moving. There’s powerful image interpolation to play with too. Without it, motion detail is a tad limited, and this really doesn’t change in Low mode. Yet Normal and High modes significantly boost clarity, and smooth out camera pans. The downside is that motion artefacts start to become noticeable. My recommendation would be to use Normal for regular TV content and sports, and to leave it off for movies, purely because it delivers the most film-like of images. The argument for a big-value 1080p PJ clearly remains compelling, and the Epson EH-TW6700 is a case in point. The absence of a 12V trigger and its struggle to really impress with inky blacks have to be taken into account, but it still feels worthy of its price tag, offering beguiling pictures.